Somewhat competent and incompetent at the same time. Its signal weakness is in its narrative that otherwise seems like such a virtue, beginning with Jefferson and Madison and only reluctantly leaving them behind. In that sense, readers might enjoy it as a survey of the later years of these Founding Fathers. The problem is...this doesn’t really explain the thesis of the book. To do so would likely go farther back, to the founding of Virginia itself, and how the attitudes Dunn continually meditates on were formed. Instead, she remains fixated on a narrow thirty year period, the first three decades of the nineteenth century, as if that alone explains why Virginia went from a political dynamo to an afterthought. She might explain the method, but she never seems to understand the reason behind it. 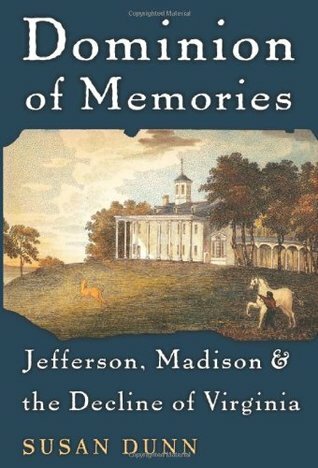 In fact, throughout the book there’s an almost apologetic approach, both to Jefferson and Madison, and little signposts, should a reader be inclined, to interpret the decline less as a purely internal affair and more a collaborative effort with a cruel outside world. Much like the more obscure figures she casts with far less sympathy to ostensibly hang the narrative. Above all, it really feels like a primer on why politics as usual remains, to this day, politics as usual, the same tactics alive in the twenty-first century as at the dawn of the country. And that’s the real tragedy here. Dunn has researched the figures in this period thoroughly - a solid history of antebellum Virginia and discussion of slavery - tied status quo prevented alternate history. Particularly interesting is the early 1830s legislative meeting that sought to abolish slavery - close vote and the failure to abolish really set tone going into Civil War. The more I read about Jefferson, the less I like him. Somewhat unfairly pins the decline of the upper South on him, but still he doesn't come off well. Didn't learn a lot of new things, but I had just read What Hath God Wrought, so perhaps that's why. The political leadership of Virginia during the period of decline shows many interesting parallels to the current GOP. I hope that Jefferson was a better man than this book portrayed him to be. Recommended, especially for the portrait it paints of Jefferson's namesake grandson. So far so good but too early to give an accurate rating.